“Love is in the air. Everywhere I look around. Love is in the air. Every sight and every sound.” Indeed. Such was the atmosphere created by the Goddesses at yesterday’s BE LOVE, BE LOVED : Celebrating Soulmate Reunions Workshop. Apart from the many beautiful teachings from the Goddesses, I really enjoyed the attunement to the planet Venus gifted by Aphrodite, the goddess of love, beauty, fertility and patroness of marriages. Venus is the lower aspect of the star system Pleiades, commonly known as Seven Sisters of the constellation of Taurus. Attuning our heart chakra to Venus opens up an energetic pathway to the Pleiadians whose genetic attributes have been encoded in the human DNA divine blueprint. The Pleiadians are great teachers of self-love, the energy frequency enabling the awakening of our Divine Self. Realising self-love is the pre-requisite for attracting and sustaining a purposeful and joyful soulmate relationship. 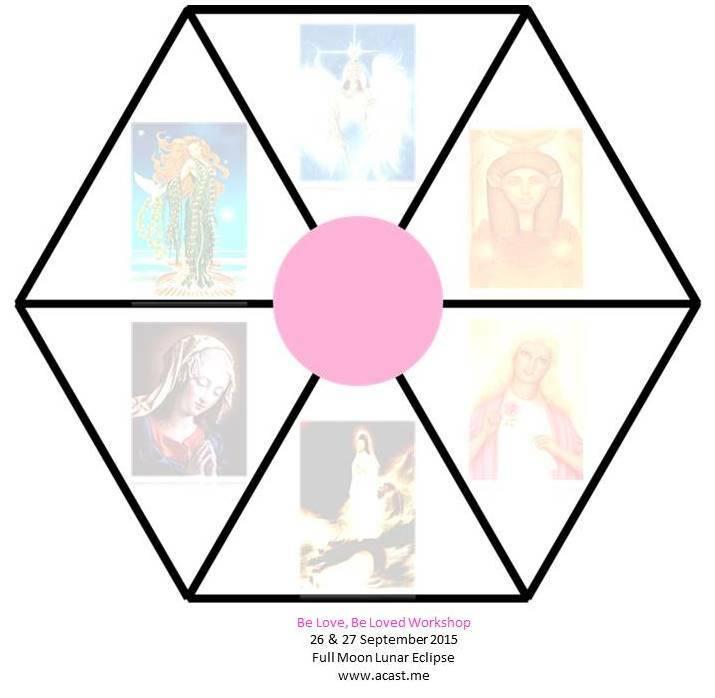 Visualise yourself seated in the center (pink dot) of a hexagon formed by the 6 Goddesses sponsoring BE LOVE, BE LOVED workshop; namely Aphrodite, Isis, Hathor, Lady Nada, Kuan Yin and Mary Magdalene. Refer to picture below. To access recorded meditation (8 minutes), click Attunement to Venus. If the hyperlink does not appear on your screen, go to our blog page http://wp.me/p22lmc-2uu to download the track. 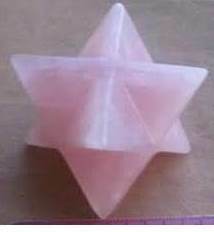 Note: The workshop participants were each given a rose quartz merkabah (diagram below) as a meditation tool. This is a not a requirement for receiving the attunement properly. May you soon experience a joyous reunion with your soul family and soulmate(s) in your current incarnation, under the auspices of these Goddesses. Product News: If you feel a pull to work more closely with the Pleiadians, check out our self-study healing program, Living Your Star Light.